"Every step is a prayer," says Jenny Norris' mother Becky Dalton, also known as Momma Grey Bear. Jenny Norris, diagnosed with breast cancer in 2016, watches from the sidelines as her family dances in the sacred ring. Norris' 3-year-old nephew, Lucas, proudly wears his signature regalia honoring people diagnosed with breast cancer. Niece, Maecyn, first broached the idea of dedicating a year of dance to breast cancer patients. "My mom did a healing dance for me," said Norris. "She then invited me into the circle. We called out for everyone to join us. The response was overwhelming. I felt loved and supported — so emotionally healing." Norris, a chef, made her signature chocolate chip cookies. She gave them to participants for a donation to her Making Strides fundraising efforts. Jenny Norris, 35, was still reeling from a recent separation from her husband of 13 years when she received the staggering news that she had breast cancer. But if that wasn’t enough to navigate, she then, after genetic testing, learned she had Li-Fraumeni syndrome, a rare inherited genetic disorder increasing her risk of developing other types of cancer over her lifetime. 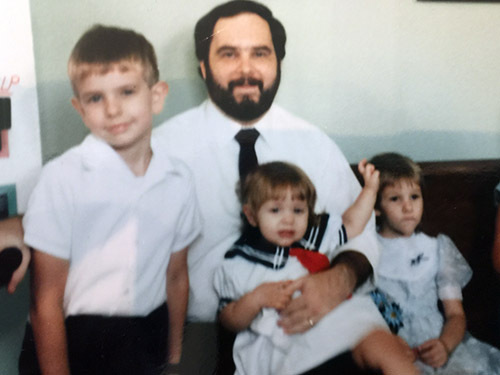 In fact, Norris’ father, Michael Farlow, then 25 years old, was at Duke receiving his first round of chemotherapy for osteogenic sarcoma at the same time his wife, Rebecca Dalton, gave birth to Norris at Duke Regional Hospital. According to the Li-Fraumeni Syndrome Association, people with Li-Fraumeni syndrome can develop multiple cancers in childhood or as young adults. Since first identified in 1969, researchers have discovered the syndrome is, in just about all cases, caused by a mutation in the p53 tumor suppressor gene. Research suggests that individuals with Li-Fraumeni syndrome who receive radiation therapy are at an increased risk of secondary cancers – that is, beyond the baseline risk associated with Li-Fraumeni syndrome. Given this, Jenny’s treatment plan was re-designed to avoid the radiation therapy. "It is not clear whether or not breast cancers with Li-Fraumeni syndrome have a different prognosis than similar non-inherited breast cancers," said Noah D. Kauff, MD, director of Clinical Cancer Genetics at Duke. "However, the risk of future cancers, both of the breast and other organs, is much higher in women with Li-Fraumeni syndrome than those women without an inherited susceptibility." Kauff went on to say that the fact that Jenny’s predisposition has been identified will allow for screenings with the hope of detecting cancer early when it is more likely to be treatable and curable. Norris, who has a degree in Culinary Arts, is a full-time food production associate for Duke and a weekend chef with the Root Cellar Cafe in Chapel Hill, North Carolina. She was working her weekend job when she received that fateful call from her surgical oncologist telling her she had breast cancer. It was Oct. 28, 2016. Without a tear or even a word, Norris returned to the kitchen and finished her shift. Norris’ mother, her step-father, Ken; niece, Maecyn; and nephew, Lucas, participate in pow wows, reunions with native family, across the state. The four dance within a ceremonial ring. 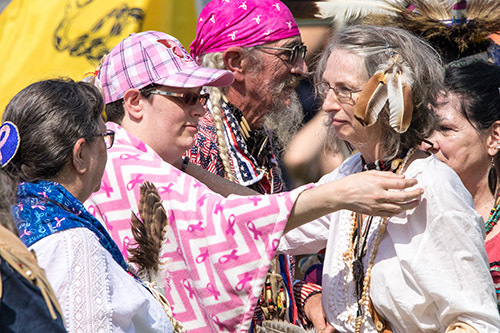 When Maecyn asked Dalton if she could dance for her Aunt Jenny, the family decided to dedicate a year of sacred dancing to Norris and all others battling cancer. Dalton and her husband designed special regalia, the clothing worn by the family while dancing, employing pink-hued fabrics to bring awareness to the breast cancer cause. To date, Norris has undergone a mastectomy of her left breast and six rounds of chemotherapy. She also receiving Perjeta and Herceptin infusions to treat HER2 positive breast cancer. Given her very high risk of developing a second (new) cancer in her other breast, Norris has elected to undergo a risk-reducing mastectomy. Her co-workers at the Root Cellar have supported her throughout her treatment, helping to keep her spirits high and sending her home with healthy take-out meals to cover the week ahead. In the meantime, Norris is defiant. Her fight isn’t over, but unless she hears that final ring of the bell, she’s in the ring, all-in, doing everything she can to raise awareness and funds in her personal quest to knockout cancer. To learn more about Li-Fraumeni syndrome, visit the Li-Fraumeni Syndrome Association. The Making Strides walk takes place Saturday, Oct. 14, at Midtown Park at North Hills Mall in Raleigh. Team Duke Cancer Institute is led by oncology breast surgeon and honorary team captain E. Shelley Hwang, MD, and breast surgeon Jennifer Plichta, MD, director of the Breast Risk Assessment Clinic at Duke. To join Norris’ team or to donate, please visit Jenster’s Fight.